Michael has had an entertaining life in many respects. He is the son of British film stars Patricia Roc and Anthony Steel whose careers blossomed during the Golden Age of British Film in the 1940’s and 50’s and who made one film together in 1952 called Something Money Can’t Buy. Michael was born in France and moved to England just before starting school. His talk was as much about Sri Lanka as discovering his own identity. His mother and the future 40th President of the United States (Ronald Regan) were briefly an item in Hollywood. We saw some wonderful slides of Michael, his wedding, the landscapes of Sri Lanka and where the tsunami hit the island and claimed lives. Michael was a photographer in the fashion industry and spent 20 years of his life travelling around the world. He first visited Sri Lanka in the year 2000 for some rest and recuperation after spending the Millenium with friends in Thailand. Alison and Michael fell in love with the area and decided to invest if they could find the right spot. When his daughter Steel was born prematurely with retinopathy, a condition that leads to blindness, Michael took to writing poems with a view to awakening Steel’s other senses. 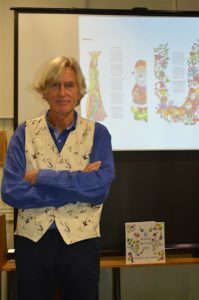 We were treated to several witty and charming verse tales that related to his talk for example there was one about a Flamingo Called Liz who conquered the world of showbiz, which Michael jokingly said is “loosely based on his mother” and creatures such as the “ugaduwe” – the Ceylon polecat. We heard about the murder of Michael’s nextdoor neighbour in Sri Lanka, a 70 year old Swiss gentleman, who had been stabbed to death in the middle of the night and what Boxing Day 2004 was like for him and his family, their neighbours and friends – the day the tsunami devastated the lives of many families living around the Indian Ocean. The hotel Michael and Alison were building remained close, while it became the local HQ for a newly launched charity Adopt Sri Lanka. Michael read another of his poems that reflected events that quite possibly took place in Yala National Park. In addition to the unexpected drama, Michael reminisced about the happy times he had in Sri Lanka. His talk was extremely interesting and very moving. We hope he will speak to our association again, perhaps in the daytime so that those of you who live outside of London will get the chance to hear about his fascinating adventures. The verse tales in Michael’s book are not all about Sri Lanka but many are influenced by his experiences in many countries, with different people, the wildlife and events around the world. 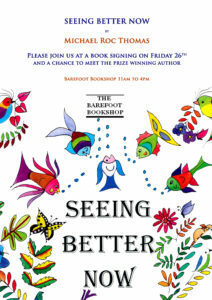 The book was launched at the Galle Literary Festival this year and is called Seeing Better Now. It comprises 56 tropical and topical tales told in verse. Each is beautifully illustrated by two of Sri Lanka’s finest female artists (Sally Hulugalle and Ruwangi Amarasinghe). The book has received fantastic press reviews this year and has already won an Outstanding Achievement in the Arts award! Signed copies of Michael’s book were available on the night for purchase. With Steele’s condition in mind, Michael is donating part of book sale proceeds to NEST, an island wide registered charity that supports children with severe disabilities across Sri Lanka, where public funding is minimal or non- existent. Michael describes Nest as “a wonderful cause managed by magnificent volunteers.” This stunningly illustrated book overflowing with wit and charm makes the ideal and amusing Christmas gift. 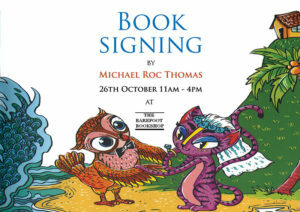 The book can be ordered directly from Michael’s website www.michaelrocthomas.com or from Waterstoneswww.waterstones.com/ipc but the charity does far better when books are ordered through Michael’s website. Michael Roc Thomas is the only son of British movie stars, Patricia Roc and Anthony Steel whose careers blossomed during the Golden Era of British Film in the 1940’s and 1950’s. After many years living and working around the world as a photographer, in 2000 Michael and his girlfriend, Alison, visited Sri Lanka for ‘his’ first time with a view to possibly opening a hotel, and later moved from London to the Deep South where they spent the next ten years. This part of the country was then little visited, let alone lived in by non-Sri Lankans as the war, though not directly affecting the area, was in full flow elsewhere. In 2002, Alison and Michael married in the small Anglican Church in Tangalle, and over the following years, whilst living the tropical dream, they survived the Tsunami, the murder of a close neighbour, a destructive raid on their home by twelve armed military deserters, and the very premature birth of their only daughter Steele. Soon after her birth, Steele was diagnosed with retinopathy of prematurity, a disease that invariably leads to complete blindness. In defiance of the odds, over the next nine months they flew from Sri Lanka to England to Canada in an attempt to save some of Steele’s sight, and it was this that almost serendipitously led Michael to begin to write: at first just simple stories and nursery rhymes in the hope of stimulating Steele’s other senses but this progressed until in January 2018, he launched his book Seeing Better Now at the Galle Literary Festival. Seeing Better Now comprises 56 tropical and topical tales told in verse. Each is beautifully illustrated by two of Sri Lanka’s finest female artists (Sally Hulugalle and Ruwangi Amarasinghe). The book has received fantastic press reviews this year and has already won an Outstanding Achievement in the Arts award! Steele (now 12), has severely restricted sight yet is doing exceptionally well; excels at music and was even admitted to Mensa last year. Join us on Wednesday 21st November to hear Michael talk about surviving and thriving in paradise. 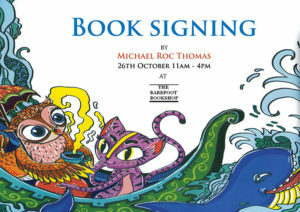 Signed copies of Michael’s book will be available on the night for cash purchase. With Steele’s condition in mind, Michael is donating part of book sale proceeds to NEST, an island wide registered charity that cares for children with severe disabilities across Sri Lanka, where public funding is minimal or non-existent. 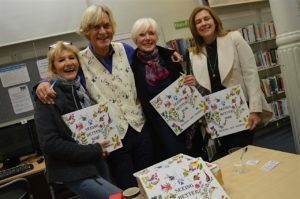 Michael describes Nest as “a wonderful cause managed by magnificent volunteers.” This stunningly illustrated book overflowing with wit and charm would make the ideal and amusing Christmas gift. 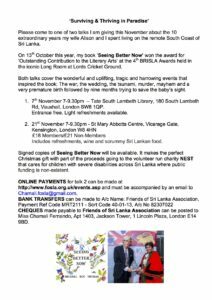 or CHEQUES made payable to the Friends of Sri Lanka Association can be posted with this slip to Miss Chamali Fernando, Apt #1403, Jackson Tower, 1 Lincoln Plaza, (Off Millharbour), London E14 9BD. 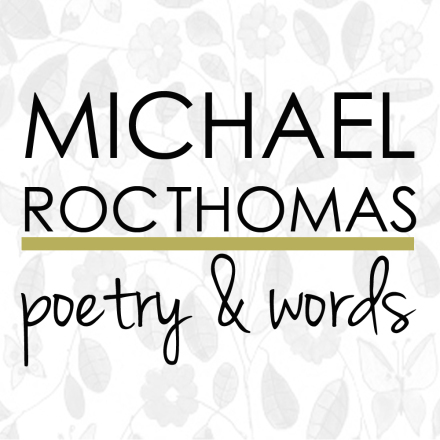 Michael Roc Thomas’s book of verses, ‘Seeing Better Now’, has been awarded the 2018 BRISLA Award for Outstanding Achievement in Literary Arts. 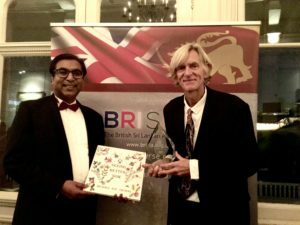 This is the fourth year of the British Sri Lankan Association awards, and the ceremony was held last Saturday at the historic Long Room at Lord’s Cricket Ground, an apt location that celebrates the common passion that binds the two islands. The award was presented by the Mayor of Harrow Kareema Marikar. Michael’s delightful compendium of verses was launched early at this year’s Fairway Galle Literary Festival. Illustrated beautifully by Sally Hulugalle and Ruwangi Amarasinghe, the magical verse stories explore so many humorous, quirky situations, many of them capturing the paradisiacal spirit of Sri Lanka, while there are tales from Australia, the UK, Switzerland and Vietnam. There are also stories of nature, of animals and conservation. With the tang of Edward Lear, Rudyard Kipling, or Lewis Carroll, the book brings a world of exotic joy to the reader.